Without sounding like a broken record, I found the article, and the accompanying images, fascinating and loved it for getting me to question the world of African book covers. I mean, until the article pointed it out I never thought of it. 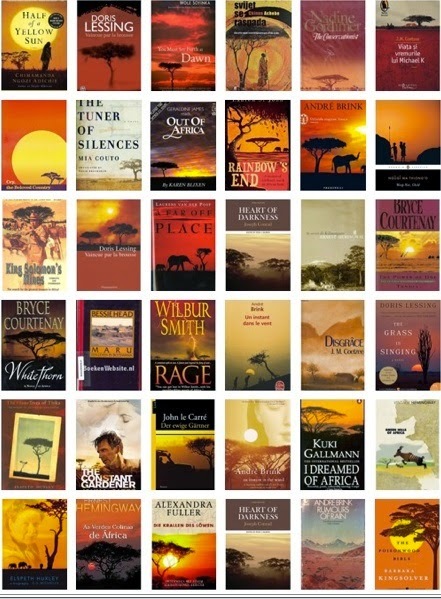 A number of articles followed on after this main one - Why do all these books about Africa look the same?, The reason why every book about Africa has the same cover - and it's not pretty, Need a cover for a your book about Africa? Just add an acacia tree - to name a few. The book desgins if I am being honest make me pretty sad when I look at them. As someone who judges books by their covers, they do not inpsire me to pick up or even read them. So I went to look at my bookshelf to see how many acacia covered books I have and then went to look at my Tumblr to do the same - not surprising little or none of both (hence, why I probably never noticed the acacia tree treatment). While I do not doubt that we are in the age of the acacia tree, or even the "soulful-black-woman-with-colourful-smudges" look in the UK, I also think we should ask ourselves the regions these book are marketed for and what they say about those regions view of 'Africa'? As I have pointed out in earlier posts, there are different book cover designs for different regions and would be interesting to know who these covers are for. I also wanted to step away from the single acacia tree book cover and decided to take screenshots of the covers I love, and have showcased on my Tumblr, to show that there are some publishers and designers out there that are not afraid to do something different. Nnedi Okorafor's Lagoon cover is beautiful. So is Noo Saro-Wiwa's Looking for Transwonderland. I loved the SA covers of The Shining Girls, as well as Zoo City and Moxyland - actually I love the covers of Lauren Beukes' novels. Modjaji Books also publishes some beautiful books. These covers, might not be in abundance, but they do exist and they give me hope that there is more to African Book Covers than the Acacia Tree. Hi, that's such a great challenge. Looking forward to following your challenges. A few of my favourite reads - From Algeria (What the Day Owes the Night by Yasmina Khadra), Angola (The Book of Chameleons by Jose Eduardo Agualusa), Ivory Coast (Aya Series by Marguerite Abouet and illustrated by Clément Oubrerie) Ghana (Tail of the Blue Bird by Nii Ayikwei Parkes) and Zimbabwe (This September Sun by Byrony Rheam).